KOBO AND INDEPENDENT BOOKSTORES JOIN FORCES TO EXPAND EREADING ACROSS THE U.S.
NEW YORK – August 29, 2012 – Kobo, a leader in eReading with over 10 million registered users worldwide, and the American Booksellers Association (ABA) today announced a new partnership to bring Kobo’s world-class eReading platform to independent bookstores across the United States. By partnering with the nearly 2,000 ABA-member stores, Kobo continues its successful strategy of working with booksellers around the world, and America’s indie booksellers grow their ability to discover and deliver great reads, in any format, to their customers. In partnership with the ABA, Kobo has developed a unique program designed for independent booksellers and their customers. Booksellers will be able to offer a total experience for their customers including a full line of eReaders, eReading accessories, and ebooks from Kobo’s catalog of nearly 3 million titles. ABA members will share in the revenue on every sale. The program includes valuable training, in-store merchandising, marketing, sales, and logistics solutions to help independents be successful. ABA members will also be able to offer ebooks directly to their customers online. Kobo expects to launch with the first 400 bookstores this fall. Since its inception in 2009, Kobo has built a global base of over 10 million registered users in 190 countries, and one of the largest eBook stores in the world with 3 million books, newspapers and magazines with titles ranging from the NYT bestseller list, the hottest new releases, Indie Next List and Bestseller List titles, and over a million free books with titles in 60 languages. With one of the largest content catalogs in the world, a line of award winning eReaders available in 7 languages, free eReading Apps, and the newly launched self-publishing program, Kobo Writing Life – Kobo has a rich eReading ecosystem and a unique win-win approach to the market. Kobo and the ABA share fundamental values that are rooted in the love of reading. The ABA and its independent bookstore members introduce newly discovered titles to readers, as well as support freedom of speech, literacy, and programs that encourage reading. Kobo’s Read Freely philosophy supports an open platform and adoption of industry standards to ensure that people own the books they buy and are never locked to one device or service. Additionally Kobo offers free eReading apps so people can read conveniently anytime, anyplace from a device they already own. With Kobo, consumers can easily browse and shop from the Kobo eBookstore and automatically sync their library across most popular devices including iPad, iPhone, Android, Mac, PC, and smartphones, as well as all Kobo eReaders. In less than three years since the company was founded, Kobo has developed a successful turnkey solution that enables a wide variety of retailers – both large and small – to capitalize on the eReading growth occurring around the world. First-class brick-and-mortar booksellers like Indigo, Fnac, WHSmith, Mondadori, Collins, Future Shop/Best Buy, Target and others have taken advantage of what has become known as Kobo’s “Playbook” to quickly introduce eReading to their customers and ultimately creating new streams of revenue by making eBooks more accessible around the world. Through the partnership with ABA, Kobo adds to this network nearly 2,000 independent bookstores that will be able to take advantage of Kobo’s unique services, including one of the largest content catalogs available today and line-up of accessible eReading devices and free eReading applications. This entry was posted in Uncategorized and tagged aba, american booksellers association, bookstores, independent, kobo on August 31, 2012 by First Edition Design Publishing. Someone recently asked me why I self-published. The truth is, when I finally decided the time was right to make my lifelong dream of writing children’s books a reality, it never occurred to me to start searching for a traditional publisher. I literally dove in! When my manuscript was complete, I searched the internet and library reading everything I could find on how to self-publish. I took one small step at a time and before long I was holding my dream in my hands. I think it’s because when I was young my parents instilled in me that I could be and do anything I put my mind to. There is always a way to figure things out if you are determined and persevere. I apply this concept to everything I’ve ever accomplished. Since my first book, I’ve experienced self-publishing and traditional publishing and I strongly encourage you to take the plunge and self-publish. You have complete creative freedom. After all, it is your baby. Why not write the story you’ve always imagined, choose the illustrator, the title and cover. A word of advice… pay attention to all the little details. Make sure your book and media has a professional presentation: terrific cover, expert editing, formatting, spine detail, website, blog, publishing logo, advertising material, etc..
You will make more money (royalties) and receive a much higher percentage from sales. Instead of 6% from a traditional publisher, if you self-print, you could receive as much as 75% when you want copies of your book. (Ed. note: POD (Print On Demand) also offers authors much higher returns than traditional publishing). You don’t have to wait; you can publish your book now. You are the publisher and the author and since you’re wearing both hats, you’re in complete control over when, where and how. You will acquire an understanding of marketing and get feedback directly from your readers. You can always decide in the future to have a traditional publisher take over the printing and sales of your book. Your success of being a published author is up to you. An informative book that will help any indie author is 1001 Ways to Market Your Books by John Kremer. Most importantly you hold all the rights to your book and have complete freedom over all aspects of your dream. Yvonne Capitelli is an authoritative children’s author and children’s motivational speaker. She has five awards to her credit for her debut, bestselling children’s book Daria Rose and The Day She Chose. They include: 2012 Nominated Best Author of Long Island, 2011 Children’s Literary Classics Gold Award and KART Kids Book List, 2010 National Indie Excellence Awards Finalist, and 2009 Moonbeam Children’s Book Bronze Award Mind-BodySpirit/Self Esteem and Preferred Choice Award Creative Child Magazine. Her books are fun, educational, beautifully illustrated and all center around imparting important life lessons. Children and adults alike will benefit from her fun and engaging stories that make you realize the amazing power we all have within. The author’s children’s book, I Get It! I Get It! How John Figures it Out, released January 2012, is about one boy’s journey and triumph with Auditory Processing Disorder. It received the Book of The Year award from Creative Child Magazine. Ms. Capitelli’s second book of her Daria Rose Making Good Choices Series is due for release later this year. This entry was posted in Uncategorized and tagged book, distribution, ebook, publishing, royalty, self-publishing, yvonne capitelli on August 29, 2012 by First Edition Design Publishing. TRIPS TO OFFICEMAX to fill up on pencils, filler paper, binders, and notebooks for the first day of school could soon go the way of the horse and buggy, replaced by trips to the Apple store to pick up iPads and iPad Apps. This September, BC High’s seventh through tenth graders will be required to obtain iPads as part of their school supply list. They join schools like Burlington High School and Sacred Heart High School in Kingston that have purchased iPads for their entire student body with the goal of cutting textbook costs and taking advantage of a wide variety of digital learning resources. At BC High, a private school in Dorchester where students must pay for their own textbooks, administrators expect the iPads to pay for themselves in cost-savings from buying ebooks instead of regular textbooks. Charlie Drane, the BC High Academic Vice Principal, said many textbooks can cost between $100 and $200 each, but the e-versions of those books are priced significantly lower. “In one class alone, it’s a $100 savings,” Drane said. Drane estimated that “potentially in two years, but certainly in three years,” students will recoup the cost of their $399 iPad in textbook savings. Not only do the e-books cost less, Drane said, but they come with more features to aid learning than the regular books do. Although the iPads are primarily for textbooks, teachers at BC High, who have already been equipped with their own iPads by the school, plan to use them for other activities. “There will be many different uses for it both in the classroom and out of the classroom, on top of the textbook replacement,” Drane said. The iPads can save paper, allowing students to turn in their assignments to their teachers in digital form. Their teachers can grade them electronically and even record their comments for the student in audio form. The idea for using iPads at BC High first surfaced in 2010, when the school’s director of technology got an iPad. He saw the potential for its use in the classroom, and last year the school purchased iPads for every member of the BC High faculty. Drane said letting the faculty use the iPads for a year gave them a sense of their value in the classroom. When it came time to decide whether to make iPads a part of the curriculum, the faculty was in full support. “It was very clear where everyone stood,” Drane said. The school decided they would require students to purchase the iPads on their own rather than the school buying them, in part to allow students to consider the device their own. So far, reaction from students has been overwhelmingly positive but parents are a little more hesitant, Drane said. The biggest issues that parents are concerned about are safety and security. A significant chunk of BC High students use public transportation to get to school, and parents are worried their sons’ iPads will be stolen or lost. Other parents are concerned their sons will access websites they shouldn’t go on to, or that their sons already spend too much time connected to technology. “We’re trying to do what we can to allay some of those fears,” Drane said. The school intends to bring in a Massachusetts State Police officer to school early in the year to talk to students about iPad safety. The school is also encouraging students to purchase insurance for their iPads to address the issue of theft or breakage. The school also sees the iPads as a great opportunity to educate students about the resources available to them through technology, while also showing them how to be responsible on the web. Ryan Bernardi, who is from Milton and is entering the tenth grade at BC High this year, said he is in favor of the iPads but thinks it may take some getting used to if teachers are asking students to use the device as a replacement for a notebook in class. “I think one challenge will be to take notes,” Bernardi said. Bernardi, who already had an iPad and had used it in some classes last year where teachers permitted them, is already seeing significant savings from textbook purchases. As for concerns about loss or breakage, Bernardi said he keeps it safely in his backpack when traveling to and from school on the Red Line. “I always check to make sure I have it,” he said. He also pointed out that the Apple store sells cases to prevent the iPad from breaking if it is dropped. This entry was posted in Uncategorized and tagged apple, ipad, textbook on August 28, 2012 by First Edition Design Publishing. Beginning – John goes to the bakery on the corner and encounters a friend from high school. Middle – They have a conversation and reminisce the past. End – Dramatic- She is the fatal instinct type and decides to kill him – or – he harbors old grudges and decides to kill her. Romantic – they find in only a few short minutes that they were meant for each other, decide to divorce their present spouses and run away to join a circus or be the first couple married on the moon. 1. Invent your characters in one sentence as John walks to the bakery. He was overweight, short and balding but lovable like a bathtub squeaky toy. He was tall, athletic and worked out – he’s going to the bakery to buy spinach blintzes damn it! He is a professor of English Lit at Vassar and buys croissants for his ten-dollar latte. 2. Invent the dialogue. They argue over insults from the past. She is witty and urbane – he is surly and dull or vise-versa. They talk of good times from the past, smile and laugh a lot. They discuss people they hated from the past and decide to become serial killers and take out the entire class. 3. Action/dialogue. Dialogue can be action if the descriptive narrative punches up the story. I want you to write a short story under 1000 words using the formula above. I find short stories much easier to write and my novels are all based on short stories. It is great fun to open a finished short story and expand it to your heart’s delight – it can begin as a quick salad good for your brain and become a gourmet literary meal with seven courses of satisfying reading. 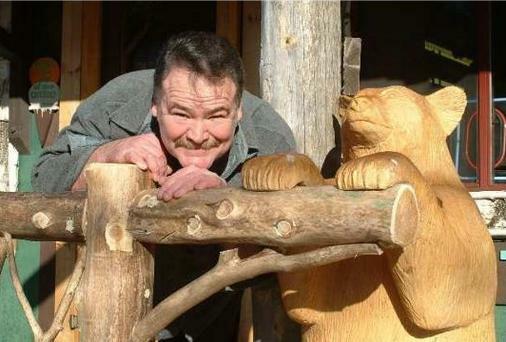 Jamie Sutliff is an artist/sculptor/author living in the Adirondack Mountains of New York. He specializes in life-sized wildlife sculpture for museums and private collections, including 2 Museums of Natural History. His work has appeared in over a dozen national magazines, most recently, The Smithsonian, Oct 2004. His research on early northeastern Native American tribes has led to the writing of three novels on the subject. Two of these novels in a three book series, “The Elves of Owl’s Head Mountain” and “The Land of the Nen-Us-Yok” were published in 2007 (regional small press) and awarded four star reviews from Foreword magazine for the learning curve offered to young adults with lessons in Native American languages, math, global warming and modern day issues woven through fast-paced fantasy plots. First Edition Design Publishing published these three illustrated books as a trilogy in May 2012 and the edition is available on eBook venues world-wide. Sutliff has written six novels (two premises for graphic novels) and a short story collection. He has five novels available in trade paperback. This entry was posted in Uncategorized and tagged author, elves, jamie sutliff, owls head mountain, writing on August 22, 2012 by First Edition Design Publishing. In spite of a stagnant economy bookstore sales rose by 3.8% in June, hitting $1.04 billion, according to estimates released by the U.S. Census Bureau. June performance numbers helped to put 2012 bookstore sales slightly ahead of sales at the half-way point of 2011, with sales up 0.6%, to $6.98 billion. Sales results were from retailers where books are at least 50% of sales. June sales were up 3.0% for the entire retail segment, while sales for the first six months grew 6.3%. Is this news too little, too late? How do you feel about it? Leave a comment. This entry was posted in Uncategorized and tagged authors, books, bookstores, ebooks, publishing, sales on August 21, 2012 by First Edition Design Publishing. NEW YORK , NY (Businesswire) Barnes & Noble, Inc. (NYSE: BKS), the leading retailer of content, digital media and educational products, today announced that its award-winning NOOK reading experience and leading digital bookstore are coming to the United Kingdom this autumn through a new www.nook.co.uk online storefront, marking the first time the company will expand its business internationally. The world’s largest bookseller will also offer its highly sought-after NOOK digital products and content to UK reading and entertainment lovers through partnerships with leading retailers expected to be announced shortly. These well-known UK partners are expected to support the NOOK offering there through both established physical and online channels. The first products to be available when the company begins offering its products in the UK in mid-October include Barnes & Noble’s line of critically acclaimed E Ink® Readers, NOOK Simple Touch™ and NOOK Simple Touch with GlowLight™, the top-ranked eBook readers in the US. With its highly acclaimed NOOK offering, Barnes & Noble has been a leader in creating innovative products that provide the best digital reading and entertainment experience for millions of NOOK customers. The company’s many groundbreaking advancements in the digital reading space include creating the 7-inch Reader’s Tablet™ category, and the world’s first E Ink device with a built-in light for reading in the dark. NOOK products are currently sold in the US at NOOK Digital Shops™ and counters in more than 1,300 Barnes & Noble and Barnes & Noble College Bookstores, and through top US retailers. The popular NOOK Simple Touch and NOOK Simple Touch with GlowLight are set to launch in the UK in time for the holiday shopping season. NOOK Simple Touch is the easiest-to-use Reader with the world’s best, most paper-like reading screen and longest battery life. NOOK Simple Touch with GlowLight adds a patent-pending lighting technology for reading in the dark, so it’s like two devices in one, as amazing at the beach as it is in bed. Both of the lightweight devices feature built-in access via WiFi® to Barnes & Noble’s leading digital catalog and an ergonomic form with a soft-touch back that’s comfortable to hold for hours. Starting this autumn, UK customers will be able to shop an expansive NOOK Store™ featuring more than 2.5 million digital titles – including top-selling UK books, newspapers and magazines – plus comics, exciting NOOK Apps and more. UK NOOK customers will be able to “Read what they love, anywhere they like™” on NOOK devices as well as their favorite mobile and computing devices using free NOOK reading apps. Purchased NOOK content is always safe and available through NOOK Cloud™. 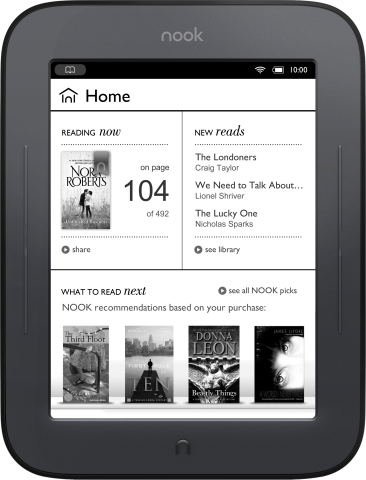 UK residents wishing to learn more about NOOK can visit www.nook.co.uk. Further product, pricing and availability details will be announced in the coming weeks. This entry was posted in Uncategorized and tagged barnes & noble, ebook, glowlight, nook, simple touch on August 20, 2012 by First Edition Design Publishing. Sitting in my own little corner of the planet I had a head full of ideas. I knew no one else had them. They were the outcome of many years of research and what I believed to be original thinking. They were also at odds in many ways with the orthodoxy in my own field. We all have our dreams. Mine wasn’t so much to become an author as to get a message across. The message was a universal one in the area of health and healthcare and I just had to get it down into the written word. I had previously self-published a book pre-internet days – local printer using old style type set and all that – and it finally served a very limited professional audience. Next there came another book for which I engaged a self-publishing company and it cost a lot of money with very limited results. This time, and with a bit more research and lessons learned, the eBook seemed the way to go. The cyber age was upon us and seemed destined to be the dominant player in the years ahead. Not only was it simple to operate as a reader, even to senior citizens like myself, but by its very nature, it was to be available instantly anywhere in the world, be it Singapore, Sydney, New York or anywhere else in the English speaking world. For an author the publishing ramifications are also a relatively hassle free process. I often compare this experience with my earlier ones and marvel at the differences but this time it was really important to me that my book would have a world-wide audience. The whole purpose was in the message and so I kill two birds with one stone – be an author globally and get the message out globally. There are publishers and publishers, of course, and my one caveat is that the choice of publisher has to be well researched. I spent a lot of time on this one and it proved to have been well worth the effort. Robert Boyd, DO, was a (now retired) Registered Osteopath, trained and living in the United Kingdom. His first love was in the field of herbal medicine and he graduated from the London School of Herbal Medicine. He subsequently became a Faculty member in their Education Department. Robert later graduated as a Registered (Licensed) Osteopath and soon developed an interest in Cranial Osteopathy. The cranial dimension became his lifetime passion. His research is groundbreaking and he is regarded internationally as a leader and teacher in his field. He is now President of the Bio Cranial Institute International, located in St Louis, MO. He is the author of An Introduction to Bio Cranial Therapy and The HeadWay to Health, with a new eBook published November 2011, The Gateway to 10,000 Illnesses. He has also authored teaching manuals and had numerous articles published in professional journals. Robert is married to Vera, a certified Bio Craniopath, Aromatherapist and Yoga teacher, and who has closely shared his journey. He has two daughters, Cheryll and Sandra and two grandsons, James and Matthew. This entry was posted in Uncategorized and tagged author, bio cranial, ebook, institute, osteopath, robert boyd, self publish on August 15, 2012 by First Edition Design Publishing. Do you wonder want readers want? In today’s writing tip, you’ll discover the 21 key traits of best-selling fiction excerpted from The Writer’s Little Helper by James V. Smith, Jr.
To sell your fiction, you must pay attention to the Key Traits of Best-Selling Fiction. FYI, the twenty-one traits are arranged in a kind of rough order. Appeals to the intellect. The first five: utility to logic. To you, the writer, they refer to how you research, organize, and structure your story. These are the large-scale mechanics of a novel. Appeals to the emotions. From a sense of connection to excitement. These are the ways you engage a reader to create buzz. Do these things right, and people will talk about your novel, selling it to others. Appeals to the soul. Comfort through transcendence. With these traits you examine whether your writing matters, whether it lasts, whether it elevates you to the next level as a novelist. Where do the 21 key traits come from? They come from the most prolific, most complete, most accessible, most reliable survey of book readers in the world. They come from my study of the thousands of reader reviews on Amazon.com. Reliable? Yes. Why? Because most reviewers visit a page to write reviews based on their emotional reactions to books. They either love a book or hate it. They were either swept away by the characters and story and language. Or they felt cheated by the author. Either way, they have to speak out. You can duplicate my research. I analyzed reviews of bestsellers, the good reviews, the bad, and the ugly. I found patterns in the way people responded and sorted reader remarks into categories. Go ahead. Find the best-selling book in the area where you want to write fiction. Find your own patterns in the first two hundred reviews. I’d be astonished if they were far from my list. These are readers telling writers what they want—or in the instance of a bad review, what they don’t want. You can learn a ton from this kind of market survey. Give it a go. Then get to writing to satisfy your readers. This entry was posted in Uncategorized and tagged bestseller, bestselling, fiction, tips, writing on August 10, 2012 by First Edition Design Publishing.